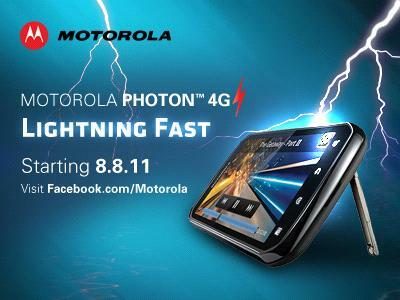 Motorola has launched a new contest called the “Lightning Hour” that will run from today through the end of August and reward lucky readers with prizes like the Photon 4G. Each contest will be up for one hour each day (the “Lightning Hour”) and will require entrants to complete some sort of simple task. The tasks will be announced through Moto’s social networks: Twitter and Facebook. Once you see the tweet or wall post for each day’s hour, you will have limited time to jump on it, so be quick! Today for example, all you have to do is head to their Facebook page, watch a video, and then enter in your info.